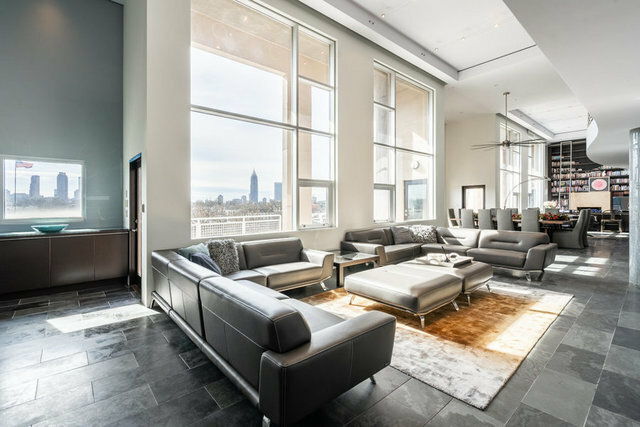 This sprawling Penthouse with a celebrity pedigree boasts postcard sunsets from the walls of windows that frame the entire city skyline! An intimate foyer contrasts the expansive living area punctuated by a gas fireplace framed a library wall complete with a library ladder. A true chefs kitchen showcases commercial grade appliances and stone countertops . Three oversized ensuite bedrooms include a guest suite on the main level. Upstairs, the master spoils with a spa bath and a dream custom closet. Two storage units and four parking spaces included! This sensational city home is located steps away from the city's new beltline trail, providing easy access to a wealth of new restaurants, shops and Piedmont Park!